An electric guitar is a guitar that uses a pickup to convert the vibration of its strings into electrical impulses. 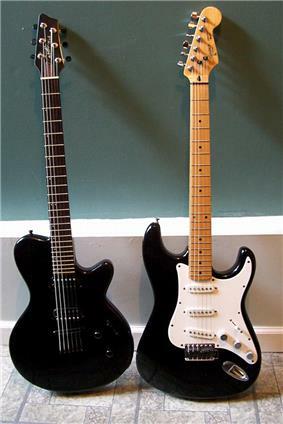 The most common guitar pickup uses the principle of direct electromagnetic induction. The signal generated by an electric guitar is too weak to drive a loudspeaker, so it is amplified before sending it to a loudspeaker. Since the output of an electric guitar is an electric signal, the signal may easily be altered using electronic circuits to add "color" to the sound. Often the signal is modified using effects such as reverb and distortion. Invented in 1931, the electric guitar became a necessity as jazz guitarists sought to amplify their sound in the big band format. Early proponents of the electric guitar on record included: Les Paul, Lonnie Johnson, Sister Rosetta Tharpe, T-Bone Walker, and Charlie Christian. During the 1950s and 1960s, the electric guitar became the most important instrument in pop music. It has evolved into a stringed musical instrument that is capable of a multitude of sounds and styles. It served as a major component in the development of rock and roll and many other genres of music.